High blood calcium over a number of years can cause kidney failure (renal failure). Nephrocalcinosis (calcification of the kidney) is a completely avoidable complication of hyperparathyroidism. Kidney failure due to high blood calcium is less common than kidney stones, but the consequences are far more severe. Kidney stones are a well known complication of high blood calcium due to primary hyperparathyroidism. The parathyroid tumor secretes PTH hormone that dissolves calcium out of the bones, putting the calcium into the blood. Thus almost all people with a parathyroid tumor (hyperparathyroidism) will have high blood calcium. Since our kidneys are designed to filter and clean the blood, they try to remove the calcium from the blood so we get rid of it in our urine. However, having too much calcium in your urine can cause the calcium to form kidney stones. About 40% of men with hyperparathyroidism will get kidney stones, and about 28% of women will get kidney stones. We have an entire web page on Kidney Stones… read it after you read this blog. Kidneys turning to stone with complete kidney failure! 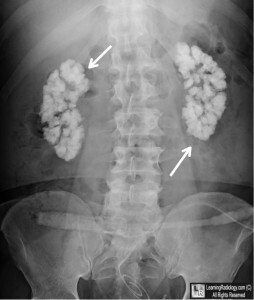 Nephrocalcinosis shown as two white kidneys. The kidneys have turned to bone because of large amounts of calcium deposited inside the kidney tissues. This is caused by untreated hyperparathyroidism and a parathyroid tumor. If Kidney stones are not bad enough, kidney failure (also called renal failure) is the next step and this can occur in people with hyperparathyroidism if the parathyroid tumor is not removed. In these cases the calcium collects within the kidney tissues instead of in the kidney tubes that make urine. So instead of getting stones, their entire kidney turns into stone! This is called "nephrocalcinosis", meaning: nephro = kidney; calcin = calcium; osis = condition… therefore "nephrocalcinosis" means "a condition by which the kidney tissues become full of calcium". Said differently, their kidneys are so full of calcium that they are turning to bone! If a person has nephrocalcinosis, then we know that 1) they have had high blood calcium for over a decade, 2) their doctor has been asleep and ignoring high blood calcium. Nephrocalcinosis is almost always avoidable and is caused by doctors "watching" the patient's high blood calcium for years saying "it isn't that that high, we can watch it a while longer." Today we operated on Jane from Orlando, Florida. Jane is a 56 year old school teacher with nephrocalcinosis and stage 4 kidney failure. Jane has been seeing the same primary care doctor for about 22 years. In 2007 (6 years ago) Jane's doctor sent her to a nephrologist (kidney specialist) because her creatinine (a blood test indicating overall kidney health) was increasing, indicating that she is developing kidney failure. The kidney specialist saw that Jane's kidneys were not working well and saw that her blood calcium was high (11.6 mg/dl), but did nothing, saying that he would see her again if her kidney failure continued to get worse. (Of course it will get worse-we didn't fix the high calcium problem!). Well, now it's May, 2013. Jane has been going to her primary care doctor for 8 years telling him how much she hurts. Her bones hurt. She has no energy. Her memory has gotten terrible. She has aches and pains all over. She can't sleep well. Two months ago this doctor gets another blood test on Jane and notes that her creatinine (kidney health / kidney failure indicator) has increased to 2.9 (normal is below 0.8). He sends her to see another nephrologist (since the first one didn't help much). This doctor notes that Jane is in "Stage IV Renal / Kidney Failure" and begins talking to her about a kidney transplant, asking who she knows that would be willing to give her a kidney. Can you believe this? Large parathyroid tumor causing nephrocalcinosis. The thyroid is absent because of radioactive iodine ablation of the thyroid. 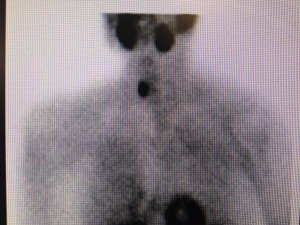 This tumor is killing this patient, and the doctors are unaware and are just "watching" her calcium levels! Lucky for Jane, her son and brother begin reading online about nephrolcalcinosis leading to renal / kidney failure and realize that nephrocalcinosis is caused by primary hyperparathyroidism. The son asks the nephrologist to check her parathyroid hormone and notes that it is over 800 pg/ml !! WOW! "What about her blood calcium" they ask. They were disappointed to realize that the nephrologist didn't even know what her calcium was-he didn't check. Of course it is high too! Her calcium was 11.6 mg/dl (2.9 mmole/L) back in 2001 (12 years ago). Jane has 21 high blood calcium levels documented in the past 11 years, and she has had zero normal calcium levels. Thus Jane has calcified kidneys (nephrocalcinosis) because her doctor is ignoring her high blood calcium for over a decade. We are unhappy with the primary care doctor who knew her calcium was high, but was "just watching it". However, we are amazed that the kidney doctor didn't even figure this out. The family had to figure this out with Google's help. That's right-the nephrologist thinks she has SECONDARY hyperparathyroidism and the high PTH is due to kidney failure. The ignorance here is palpable. This lady has zero component of secondary (renal) hyperparathyroidism, she has primary hyperparathyroidism which has gone untreated for over a decade and this has killed her kidneys. The nephrologist gave her high dose vitamin D, (again, ignorant-you cannot give vitamin D to a person with high calcium-it will make the calcium go higher). Jane's calcium went to 12.9 and finally her family said "ENOUGH! ", and they gave us a call. This is a simple problem. The high blood calcium has been ignored for years and it is building up in Jane's tissues, specifically in her kidneys. Jane is dying from un-treated primary hyperparathyroidism and her doctors are watching it happen. Huge parathyroid adenoma is 15 years old (at least) and has caused Jane's kidneys to turn to stone! 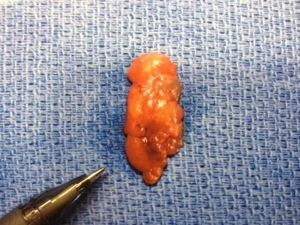 Today we removed a huge, 15 year old parathyroid tumor out of Jane's neck. The entire operation took 16 minutes and she went home just over 1 hour later. Her other three parathyroid glands were perfectly normal (she had one parathyroid adenoma, like most people with primary hyperparathyroidism). I told Jane to expect her kidney failure to improve slowly, just a little bit, however it is possible that this parathyroid tumor was removed too late. It is possible that she will need a kidney transplant. High blood calcium kills people. Jane's doctors were worried about her high cholesterol, but high blood calcium is much more deadly than high cholesterol, and it makes her feel bad and takes away the joy of life. It is not normal to have high blood calcium and the longer it is high, the worse damage it will cause. Remember, it is NOT how high the blood calcium has become, it is how LONG it has been high-even a little bit high. Adults over 40 should have calcium levels of 10.0 mg/dl or lower (2.5 mmole/L or lower for our Canadian and European friends). One final lesson for you all. Nobody is looking out for you but you. If you are reading this, it is very likely that you know more about hyperparathyroidism than your doctor does. Always get a copy of your blood work and laboratory test results. Do NOT rely on your doctors-many of them will let you down. Watch our animation showing calcium forming kidney stones during primary hyperparathyroidism. Read our page on Kidney Stones. Read more about the symptoms of hyperparathyroidism. Read more about radioactive iodine ablation of thyroid causing parathyroid adenomas and primary hyperparathyroidism. See more x-rays of nephrocalcinosis.